Sandtown-Winchester is a FutureCare owned facility that maintains 148 certified beds, and provides short-stay rehabilitation, long-term care, and other services such as extended care for treating complex medication conditions in West Baltimore. FutureCare has managed and operated this facility since 2007. Medicare gives FutureCare a four-start rating, which is pretty good. Then again, you would read the Medicare report and you would see that bed sores are just not a problem. The family of a man who was a patient there would disagree. They brought a wrongful death lawsuit against this facility in 2016. In Hargrove v. FutureCare Sandtown, the family's attorney alleges a classic pressure sore assisted living case involving an immobile woman who did not get the repositioning and other care she needed. Assuming this lawsuit is meritorious - and the facts seem plain that she came in without bedsores and died as a reslt of them - it raises real questions? Was this a one-off for this nursing home? Or are they just good at handling and blowing smoke during inspections? Sister Company Competitors: FutureCare Sandtown-Winchester is one of three FutureCare facilities within two miles of each other in Baltimore. Being so close, and all part of the same company, they nonetheless differ in their Medicare ratings. FutureCare Homewood: If you add up their Medicare stars, both of these FutureCare facilities get 15 (which translates into a 4-star above-average rating overall for each of them). But their stars are distributed differently: Homewood got four stars apiece for its health inspection and staffing (versus three stars for Sandtown), but sibling rival Sandtown beat Homewood, five stars to 3 stars, on quality measures. FutureCare Charles Village: Of the three FutureCare "sisters" within two miles of each other, FutureCare Charles Village is slightly the underachiever. Sandtown and Charles Village both got three stars for their health inspections and staffing, but Sandtown got five stars on quality measures (versus its sibling's four stars) and a 4-star rating overall (to Charles Village's three stars). Maryland Baptist Aged Home: This Baltimore facility's Medicare ratings are nearly identical to those of FutureCare Sandtown, except on staffing: Sandtown got three stars, and Maryland Baptist got two stars. Fayette Health and Rehabilitation Center: Fayette and FutureCare are almost twins, in terms of their main Medicare ratings: both of these Baltimore facilities got four stars overall, and three stars for their health inspections. Fayette beat FutureCare, four stars to 3 stars, on staffing, but FutureCare Sandtown won, five stars to 4, on quality measures. Maria Health Care Center, Inc.: This facility is not only one of the best in Baltimore: with 5-star Medicare ratings right across the board, Maria Health Care is one of the best in Maryland and the entire United States. FutureCare Sandtown got above-average ratings but still came not even close to matching this facility's "perfect" scores. Transitional Care Services at Mercy Medical Center: This Baltimore facility is located very close to the Maria Health Care Center, and it almost bids to compete with its 5-star neighbor - getting an overall 5-star Medicare rating and five stars for staffing. The mystery is how Transitional managed to get a bleak 2-star rating for quality measures, even though located within Mercy Hospital. For quality measures, FutureCare Sandtown got an outstanding five stars. The most recent Medicare health inspection (for which this facility got an average 3-star rating) turned up a total of 7 deficiencies here. On this point the FutureCare facility beat the Maryland average (11.4) and barely edged the national average (7.1). With respect to fire safety, FutureCare Sandtown had only two deficiencies, versus the average of 4 for Maryland and 3.4 on average nationally. FutureCare Sandtown also got the 3-star average rating for staffing (which, in this context, really means nurse staffing). In terms of daily time spent with residents by LPNs and LVNs (licensed practical nurses, licensed vocational nurses), this FutureCare facility was almost exactly even with both the Maryland and the U.S. averages. However, it gave residents below-average amounts of time with RNs, certified nursing assistants, and physical therapists, and it also was sub-par in terms of the total nursing time per resident per day. As such, its overall 3-star rating for staffing seems to be a bit of a stretch. The same may apply to its 5-star rating for quality measures: it appears to us that the scorekeepers were a tad generous. Perhaps they were rounding their numbers up. For the nine categories Medicare measures for short-stay residents, Sandtown was better than Maryland statewide, and the U.S., in three categories; worse in three categories; and about equal in three. This facility's best metric, ironically given the lawsuit we talked about above, for short-stay residents was for the incidence of bed sores: the incidence rate here was a nearly negligible 0.1 percent, versus the Maryland and U.S. averages (1.3 percent and 1.2 percent, respectively), which were over ten times higher. FutureCare Sandtown was about on par with the Maryland and U.S, averages on successful discharge rates, but its discharged patients were slightly less likely than average to need rehospitalization. This facility beat the state and U.S. averages by a nose on improving short-term stayers' functionality. On the downside, however, this facility was about twice as likely as average to administer antipsychotic meds to these residents and less likely than average to give them flu or pneumonia shots. It appears clear from the Medicare stats that this facility earned its 5-star rating for quality measures based on its services to long-stay residents - scoring better than Maryland and the U.S. averages in 11 of 15 categories. The rate of UTI infections among this facility's long-term residents was less than half the state and U.S. averages; only half as many of these FutureCare residents reported having serious pain, compared with the Maryland and U.S. averages; and these residents were three times less likely than average to experience a fall with injury. Assuming these stats accurately reflect the quality, these are pretty good numbers. FutureCare Sandtown was better than the Maryland and national averages for limiting the incidence of pressure ulcers (again, ironically) and ongoing catheterization; it did better at helping long-term residents maintain healthy weight levels; and it subjected none of these residents to physical restraints. For long-stayers, this facility had a better record on flu and pneumonia vaccinations, beating the Maryland and U.S. averages in both cases. This FutureCare facility was only slightly below the Maryland and national averages in terms of maintaining long-stay residents' mobility, and their ability to carry out their day-to-day activities independently. It did have a higher rate of incontinence (69.5 percent, versus 58.5 percent for Maryland, 46.8 percent nationally). The depression rate among long-stayers here also was high: 9.7 percent, versus 4.7 percent statewide, 5.4 nationally; on the other hand, FutureCare Sandtown was only about half as likely as the Maryland and U.S. averages to dispense antianxiety or antipsychotic meds. Realistically, it is really hard to do well at both keeping depression and antidepressant medication down. Some nursing homes pull it off but it really is a tough feat. It is not all that uncommon for a nursing home to have complaint inspections, even if its overall Medicare metrics are very good. FutureCare Sandtown had a complaint inspection in October 2015, but the issues at hand were rather minor in the context of problems that lead to nursing home lawsuits. Both issues concerned accounting matters, not some aspect of nursing care. First, Medicare found that the facility had failed to record all residential monetary transactions. Medicare also found two cases in which the facility transferred funds from deceased residents to its own account (as payment for services rendered) but did not promptly refund overpayments to the two estates in question. It is possible that both complaints would trace back to the oversights of a single business office employee. However, FutureCare Sandtown also has distinguished itself (if that is the right word) by receiving a federal fine within the past three years. That fine, assessed in August 2015, was for $1,950 - not a huge amount. But it is still noteworthy since nursing homes rarely receive federal fines. The lack of attention to detail also leads to bed sore lawsuits. Because in a nursing home, the details are sometimes life or death. With a total of 138 residents at the last official count, FutureCare Sandtown was larger, in terms of population, than both the average Maryland facility (107.5 residents) and the U.S. norm (86.2 residents). Its resident count meant that this 148-bed facility was filled to 93 percent of capacity. This facility may or may not be "like home," but it is very close to being a full house. Look at nursing home lawsuits filed in Maryland in 2016. We breakdown a number of nursing home lawsuits. We breakdown all of the Maryland nursing homes like we did for Sandtown. 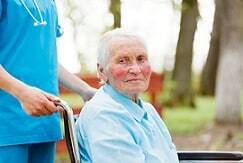 Call our Baltimore nursing home lawyers right now at 1.800.553.8082 or get a FREE online case review. We can help you.